Welcome to the first Diamond Buyer Bout of the WWF! The WWF is the “Watch of the Week Fight”. Why am I starting these bouts? Being a watch fiend (which is a disease I hope there is no cure for), I notice that many brands take a good model and remake that model, give it a new name with a few differences and then sell it. And, what is going to make the Watch of the Week Fight so interesting, is that I am not going to tell you what models are up against each other. I am going to give you all the details about each watch, then I want I want YOU to chime in and tell me which model you think is which and which model you think wins the bout! I don’t find this either a good or bad practice, because I am one of the consumers that will buy both models, especially if I like the brand and feel it is a great watch, so I want to know YOUR take on this! Let’s get ready to tick-tock! This inaugural bout of the “Watch of the Week Fight” is between two Rolex’s. You all know that I am a Rolex lover. I own many, sell more and buy even more. I consider myself to be an expert in Rolex and read up on everything and anything Rolex. In fact, this is one of the few watches that I buy new and used, because I believe it is one of the few watches that holds it value so well. In the left corner we have a Rolex and in the right corner with have a Rolex. 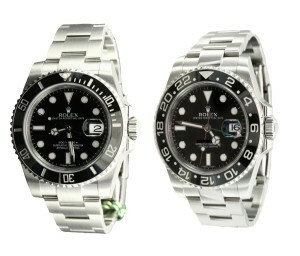 Both of these watches are strong with their stainless bracelets, although the Rolex in the left corner has a brushed band and the Rolex in the right corner has center links that are high polished. Each has a black face with black ceramic bezel and magnified date on the face. Each has a sweeping minute hand and each was launched around 1954 and each now has white lettering on the face of the watch, and is considered a sport watch for the Rolex brand. Each Rolex has a case that is made of 904L stainless steel that is corrosion resistant and both watches are self-winding. Both of these Rolex watches have the Oyster case, which has the Triplock system that features a triple gasket which screws down tightly onto the case to provide a layer of protection against everything. But, the watch in the left corner is waterproof up to 980 feet and the bezel only rotates counterclockwise. The watch in the right corner has an extra hour hand and can tell time in multiple time zones. Each watch runs about the same retail. One is for diving and one is for flying. Can you tell which is which? And, which Rolex do you think wins in a head to head watch of the week fight?